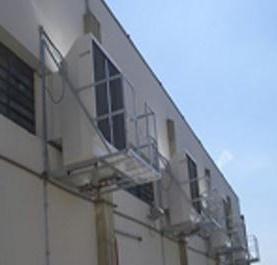 The evaporative Cooling has a very simple operation, which reduces the temperature of any location where it is applied, and also increases the relative humidity, enabling a huge thermal comfort. One of the great advantages of this product is the very low energy consumption. The ideal installation form for an evaporative air Cooling is fixing it on a wall. That way, the equipment will capture the hot outside air and, with the evaporative process, this air will be cooled and humidified by the action of water, making the environment more pleasant and healthier air quality. If the chosen installation is internal, the ideal is that the air conditioning is set in position for a window, door or any other kind of space in which there is an opening to the external environment. That’s because the renewal of air is essential to maintain the efficiency of the cooling evaporative air conditioning. The result in acquiring a evaporative air conditioning normally exceeds the expectations because your performance guarantees comfort, with great savings compared to conventional air conditioning, besides being a compact unit, high durability, which requires little maintenance and your operation is ecologically clean. The Basenge is a company that manufactures products with excellence in HVAC equipment for over 19 years, among them the evaporative air cooling. Their products are very efficient, and stand out for having many beneficial qualities for users. The company’s Basenge service is performed throughout Brazil and the company also has operations abroad, with a team that is always ready to serve customers with the goal of delivering a final result very positive. Learn more about Basenge, please contact us and request a quote of the products and services offered, such as industrial air-conditioning, climate control system of industrial air, industrial air conditioning and more.